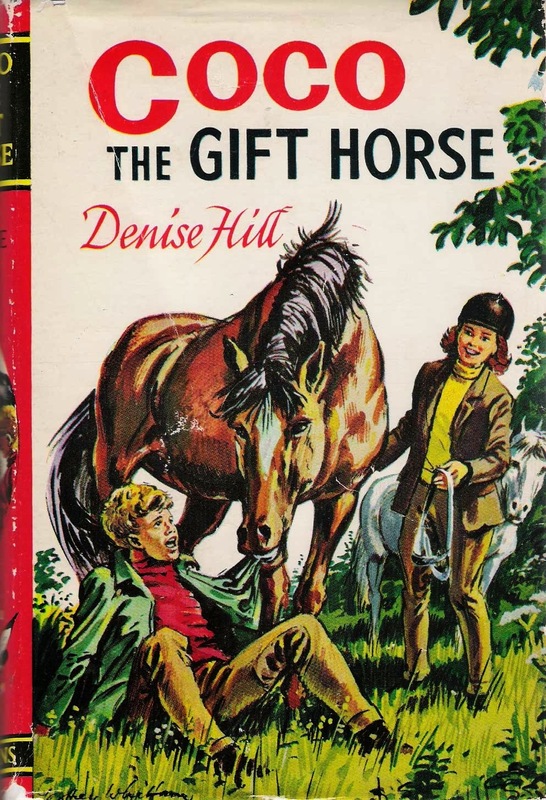 Denise Hill isn't one of the best known of pony book authors. 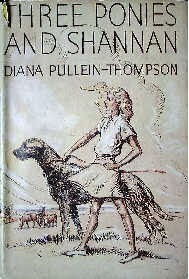 She wrote two other pony books: The Castle Grey Pony (1976), for the younger reader, and A Pony for Two (1965), the precursor to Coco the Gift Horse (1966). The hero and heroine of A Pony for Two, Jane and Jeremy, see their dream come true. They get a pony. With Falla, however, they get mystery and adventure as well. Falla has some unusual talents, and not only that, she appears to be causing other people to take notice of her. Falla disappears. Michael Maguire has a solid set of adult racing novels to his name, but he also has a couple of books written with a sort of lunatic invention that makes them stick in the mind of everyone who read them. The pony book world has its share of wildly imaginative books which take off into fantasy, but they're rare. Such books don't chime with the girl plus pony plus gymkhana blueprint, although winning the bending each and every time not because of your immaculate riding, but because of your finely engineered horse, has a certain attraction as an idea. Because the Mylor books featured a horse alright, but Mylor was a robot. Despite that, Mylor has character - bucketfuls of it, in fact. Allen W Seaby wrote pony stories which carried on the grand tradition of the pony telling its own story. Where he differed from his predecessors was in his focus on native breeds (beside the New Forest, he also covered the Dartmoor, Welsh Pony, Shetland and Exmoor), and his concentration on the wild pony and how it related to its environment. Not for him the brushing over of the inconvenient nasties of equine life: In his Dinah the Dartmoor (1935), he describes an account of a fight between two ponies as "kicking and biting, ...strands of hair torn away.. bruises and blood-spots." It was, as he acknowledged, daring of him to include such a scene. His first work of fiction, Skewbald, the New Forest Pony, (1923) was republished many times, and it's quite likely you'll have seen it in its later incarnations, with the sweetly domestic mare and foal scene on the front cover. There can't be many pony book fans from the 1970s who don't have a copy of The First Rosette. It was one of those books I seemed to see everywhere in my own obsessive hunt for a book with a pony in it. Whatever else the book shops of Northamptonshire lacked in the pony book department, they would always have a copy of The First Rosette, with its vivid blue backed Mary Gernat cover. The First Rosette (1956) is one of the earliest (if not the earliest) pony books to feature a working class character. David Smith is the youngest son of a family who really struggle for money. Unlike his brother, he's not going to find his way out of his situation through education. David does it through sheer hard work. "When I wrote Royal Crusader I was told that I had "attributed to a horse knowledge of everyday human activities that a horse could not possibly have." This was confusing, because both those horse heroes, the High Mettle Racer and Black Beauty, have an astonishing knowledge of human beings. But as the book was written in an honest endeavour to help my greatest friends - horses and ponies - I considered their case was best stated by a horse. The success of the book proves I was justified." So there. Mary Treadgold was the editor of children's books at Heinemann during the first part of the WWII. She received pony book after pony book, the majority, she said, equally badly written. (In passing, I would love to know what she rejected.) She thought she could do better herself, and so in the autumn and winter of 1940, as London was pounded by German bombs, she wrote We Couldn't Leave Dinah (1941) in an air raid shelter. (It will feature in a later PBOTD). Vian Smith is not the author to go to if you want comfortable and predictable pony adventure. His characters have difficult challenges to face. 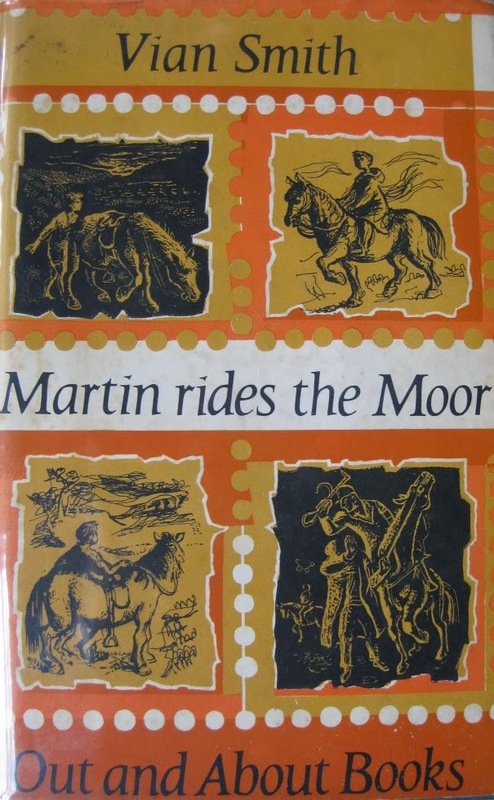 Today's pony book, Martin Rides the Moor has a hero who has gone deaf after an accident. His parents are worried about him, naturally enough, as he struggles to adapt to a new existence with only minimal sound. They buy him a Dartmoor pony, Tuppence, in the hope that giving him something to care for will help him. At first, Martin wants nothing to do with the pony, and he remains closed in and determined in his resistance until he has to fight through the snow to rescue Tuppence. It isn't all plain sailing after that: Vian Smith has much more for his characters to go through, but the book is, ultimately, hopeful. Kathleen Mackenzie was part of the explosion of pony books which happened in the 1950s, but when you read her books, you can't help but feel her heart was elsewhere. Like Mary Gervaise, she preferred families and what happened within them to long and loving descriptions of pony care and gymkhanas. John Ivester Lloyd's Joey (1939) was the author's first book. It's the life story of a pony, who is brought up on a farm, sold to a girl called Susan, and then hunts. The 1930s was a decade which saw a transition from the pony biography story of which Joey is an example to stories where the interest was centred on the human element. John Ivester-Lloyd adapted what he did: his later stories saw him leaving the pony biography well behind him as he switched to adventure stories. Two of his adventure stories are particularly interesting as they appeared in the form of booklets printed for Moss Bros, then a well-known provider of riding kit. Presumably these short adventure stories were given out to children waiting to be measured for their riding clothes to still the agony of the wait. Come on, Young Riders! was illustrated by Peter Biegel; Adventure of Two Young Riders by John Ivester-Lloyd's father, Tom Ivester-Lloyd, a well known sporting artist. I've moved to the 1990s for today's pony book. By that time, there were fewer pony books being published than in previous decades, and The Deceivers (1990)was one of an increasingly rare breed. Armada did publish some books as first editions (Patricia Leitch's Jinny series was a particularly notable example), and The Deceivers was an Armada original. It's not the usual tale of girl gets pony. Girl does get the pony, but it's totally unsuitable, and is in fact a horse - a thoroughbred, the sort of horse of which a horse mad girl dreams that she, only she, will be the one to find the key to poor, spoiled, dangerous him. Unfortunately for heroine Lucy, she doesn't have the backing and advice of a practical, sensible, and yes, moral, Mrs Darcy. Lucy has Janey Squires, who owns the riding school at which Lucy's going to keep her horse. Today's book is Irene Makin's Ponies in the Attic. This is quite a timely book for me, as it's about having to move away from a house you love. Heroine Debbie is fulfilling the moving to the country dream, but she's lonely, as she finds her cousins and her aunt, with whom she lives, difficult to get on with. The house is in the New Forest, and in the attic Debbie finds someone's drawn pictures of the ponies on the walls. They were drawn by Dan, who used to live in the house, and who misses it desperately. 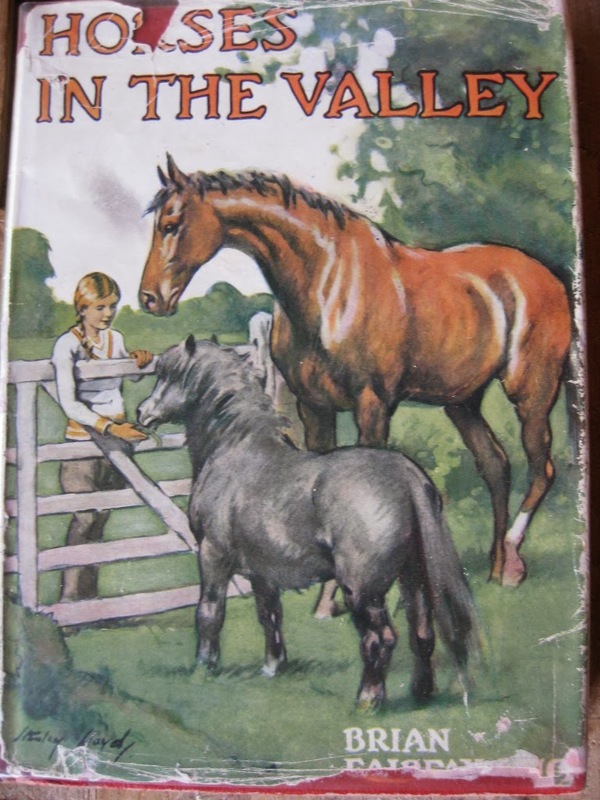 To celebrate Valentine's Day, here is one of the few British pony books to feature romance. It doesn't happen for Jill, (was she fonder of John in Jill's Riding Club than she was of James Bush? We will never know), Jackie or Jinny, and if Collins had had their way, it wouldn't have happened with Noel and Henry either. Did you dream of a life with horses once you were finally free of the shackles of school? I did. I read those stories where children took over the running of the riding school after an accident or illness conveniently carried the owner off, and I was absolutely sure I could do just as well as they could. If that failed to happen, and I was realistic enough to work out that the convenient illness didn't actually happen that often, and even if it did, there wasn't a huge likelihood I'd be on the scene to help out, well then I'd go on and ride for someone - my dreams were a bit vague on exactly who this would be, but I would show jump my way round the country. Golden Gorse was the pen name of Muriel Wace. Her own early experiences of ponies were a world away from the sensible, ordered process she recommended in her first book, The Young Rider's Picture Book (1928). Muriel was the youngest of five sisters, whose mother died when she was eight. Her father, Ashley Maude, was a keen rider, but not particularly keen on serious tuition for his family. He bought the girls two unbroken Welsh ponies. One was so wild it was sold in pretty short order. Knowing what the one left was like, I do rather wonder just what depths that pony plumbed. "Jaden turned to me and grabbed my arm. "Let's go," he said, his voice hard. "No, wait...! I struggled to free myself and he tightened his grip, digging his fingers painfully into my fresh bruise." He fails to get Tea to leave, so he grabs her, throws her over his shoulder and carts her out. Shirley Faulkner-Horne's Pat and Her Polo Pony - The Power of a Charm is today's Pony Book of the Day. The heroine, Pat, was one of those children who cropped up fairly often in inter-war books: the child of parents living in India who was shipped back to the mother country for the sake either of their health, or their education. Pat's father, it must be said, only serves in India because he can't afford to hunt and play polo in England. Pat is sent off to stay with cousins she's never ever met, dreading it as they are horse mad and she is petrified of ponies, after she broke her arm in a fall. In another sign of the times, her uncle is a vicar who is able to keep several ponies, something very difficult to achieve on a vicar's salary these days. I was very tempted, when writing Heroines on Horseback, to use the original cover for Horses in the Valley as the cover illustration for my book, but that didn't quite happen. It's a classic of its type, and to me it expresses all the important elements of a pony book: you've got the girl feeding the ponies, and a focusing of the attention just on the girl and the horse and pony. The whole world is focused on them.